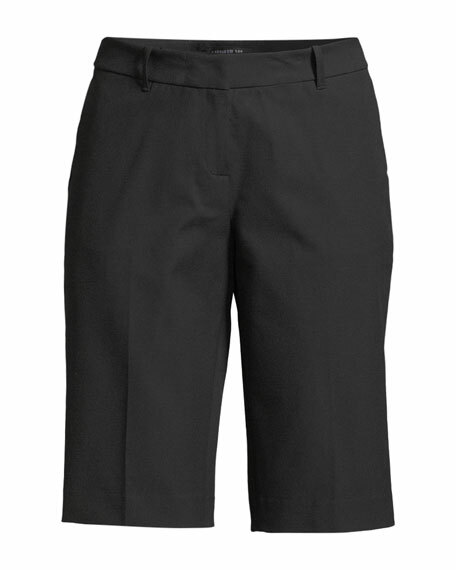 Lafayette 148 New York "Manhattan" shorts in techno-stretch twill. AG "Brezlyn" girls' shorts with light whiskering. Striped side taping with beaded border. High-low, raw edge hem. Button/zip fly; belt loops. Five-pocket style with faux back pockets. Cotton/polyester/viscose/spandex. Imported. AG "Garden" denim shorts with light distressing and whiskering. Heart and floral embroidery through sides. Button/zip fly; belt loops. Raw edge hem. Cotton/polyester/viscose/spandex. Imported. Billieblush two-tone denim shorts. Heart patch at left leg. Button/zip fly; belt loops. Five-pocket style. Raw edge hem. Stepped side seam. Cotton/spandex. Trim: cotton. Imported. FRAME "Le Vintage" Bermuda shorts in lightwashed denim. Approx. 11" inseam. Five-pocket style. Slim, straight fit. Cropped above knee. Raw hem. Cotton/polyester/spandex. Polyester/cotton lining. Machine wash. Imported.